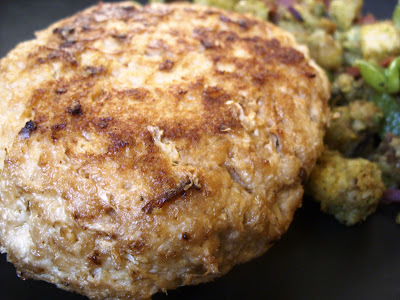 Make your Match Vegan Meat Pork into patties. You're going to take your Pork and divide into 3/4 cup servings, and then halve those. Then, make each portion into flat patties about the size of your hand. In your handy cast iron skillet, heat 2 Tablespoons of Olive Oil and a dash of Liquid Smoke on a medium heat. Slice the Fake Bacon into bite-size pieces, and then toss into the hot Oil. When it starts to get a little crispy on the edges, toss in the Onions and Peppers. Cook until the Vegetables are tender and the Bacon is crispy. Then, remove the Veg & Bacon Mix, put it into a bowl, and set aside. In the same heated Oil, toss in the Cornbread, Water and Margarine. This is going to cook quickly, so just keep flipping it and making sure it gets covered in the hot Oil and melted Margarine. Once the stuffing is cooked, add the Veg & Bacon Mix and mix. Then, add the Creole Seasoning. You're going to flip this mix and stir it for less than 5 minutes. The Cornbread and Bacon will have some crispy edges and the Vegetables should be tender. Now the world is an imperfect place. So there are bound to be a few of your patties that are just slightly larger than the others. Take a larger patty, put 1-2 Tablespoons of stuffing in the center, and top with 1 1/2 teaspoons of Daiya Cheddar. 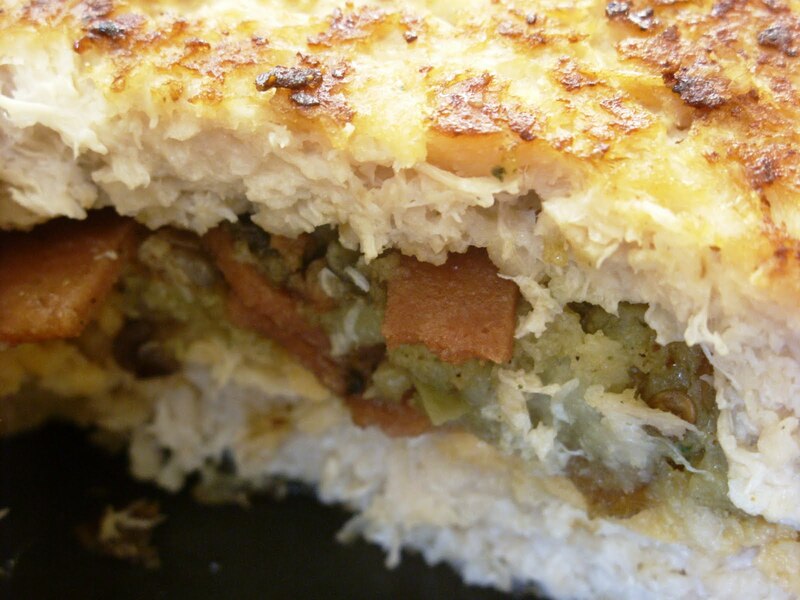 You're going to want to gently squish the stuffing and Daiya together into a flat ball, so it's pretty solid. Be careful that you don't push through your Pork patty - so don't push down too much. Take one of the Pork patties that isn't as large and place it over the Cornbread & Cheese ball in the center. Now, with your fingers, seal up the sides and very gently form the Patties into your chop. They should be about the size of your hand, and the sides need to be completely sealed - no seam should be visible between the 2 original patties. Now, your famous little cast iron skillet should still be hot from all the Stuffing cookin'. Add another 2 Tablespoons of Olive Oil and another dash of Liquid Smoke and keep it at a medium heat. Put your Pork Chops in the skillet and lightly sprinkle Creole Seasoning over the top of your chop. Let them brown a bit, then flip those babies. Then, lightly sprinkle Creole Seasoning on that side too. Keep flipping and letting them brown. Once they're golden brown and have a crispy skin, they're ready! We made 2 chops, so we had leftover stuffing for a side dish. But this recipe makes enough stuffing for 4 chops. Here's what the inside looks like once it's all done. YUM. PS - I was checking out Herbivore's website this morning and decided that if I won the $25 Gift Certificate from The Herbivore Meets The Shannons Contest, I would buy this shirt! I'd wear it while I shot disapproving looks at hipsters who think it's "cool" to be unoriginal dicks and worship bacon. I just don't get how people who pride themselves on listening to the most obscure music they can find and being so very original can have such a collective obsession with something so played out... and just mean. *Not a photo from our wedding but these people are pretty sweet. Oh my...those look ridiculously good. I NEED to make these! Switch out Trader Joe's for Whole Foods, and your weekend excursions sound just like ours (including the zombie game)! This recipe looks so yummy! I'll definitely be giving it a try.